Today is apparently all about taking air travel from awful to marginally tolerable, the latest of which comes is this brilliant little armrest divider from Soarigami. Because airplane seats are already cramped enough without having to elbow-stab a stranger to claim your turf (and urinating to mark your territory just makes a mess). 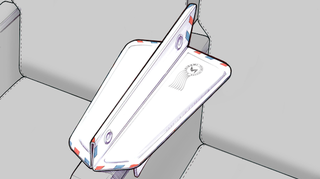 Unlike previous armrest adjustments that came before it, Soarigami doesn't require changing the very furniture around you for the sake of your neuroses. Rater, it's an adjustable, foldable board that seems vaguely akin to Apple's proprietary iPad covers. Unlike products like the Knee Defender, Soarigami fosters a sharing environment that makes the skies just a bit friendlier. Unfortunately, the Soaragami won't be available for preorder until sometime in early 2015, but you can sign up here to be one of the first to know when it's time to claim one of your very own. Still, at least for now, you'll have to make do with a DIY version. We're sure erecting walls of cardboard and duct tape around your seat won't bother TSA one bit.